Lugano is on the long, narrow, winding shore of Lake Lugano, and shares the wonderfully temperate micro-climate and stunning alpine setting of the Italian Lakes, despite being within Switzerland. The best places to stay in Lugano offer similarly stunning lake views and mountain backdrops and a similarly elegant city setting. Expect palm trees and picturesque boulevards below alpine hills and mountains. 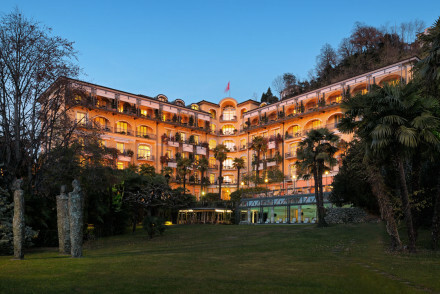 Many of the best places to stay in Lugano are definitely those closest to the lake, but if you’re looking for great value, peace and quite and spectacular mountain views then it’s certainly worth considering the properties up in the hills above the lake - especially between Lake Lugano and Lake Como. Lugano is only half an hour from Como or Varese, so it’s a great base for exploring not just Lake Lugano, but also the neighbouring lakes. You’re also only an hour and a half from Milan. Explore Monte San Giorgio, a wooded mountain best known for its wonderful oceanic fossils from the Triassic period - there’s a great little fossil museum. The Herman Hess museum, has some of the thousands of watercolours he painted in this region, plus some of his books and personal effects. It’s unusual but popular. The Parco Scherrer in Morcote is a wonderful park with a subtropical feel and some amazing architecture. There’s a great smuggling museum on Gandria, and Lugano also has Europe’s largest casino. In Melide you can visit Swissminiatur, which has 1:25 scale models of around 120 of Switzerland’s best known attractions. Don't forget to book well ahead if you want to reserve a room in one of the best places to stay in Lugano in July or August - it's very busy during the peak summer months. Alternatively plan your trip in the quieter autumn or spring months, when the weather is still warm, but the crowds are nowhere to be seen! Once a mansion belonging to Russian nobility, the Grand Hotel Villa Castagnola is now a five star grand dame hotel in an incredibly beautiful setting. There are 78 rooms, each with their own unique character and traditionally luxurious decor, plus there’s a Michelin starred restaurant. Lakeside pampering amongst some of the most spectacular Lake Lugano scenery imaginable. Villa Principe Leopoldo is set in the former palace of a prince, Villa Principe Leopoldo certainly retains its regal grandeur. With opulent rooms, a fantastic restaurant and a charming piano bar, it's a lavish affair. Luxuriate in the Kiso Spa and in the summer recline by the divine pool. An encapsulation of serenity. For total opulence in stunning surroundings The View is a fabulous five-star hotel with a view fit for its emphatic title. The minimalist suites are sleek and cool with sharp contemporary design features and staggering vistas over the lake. Explore the shores of the lake by bicycle or complimentary e-cars. A tranquil oasis. 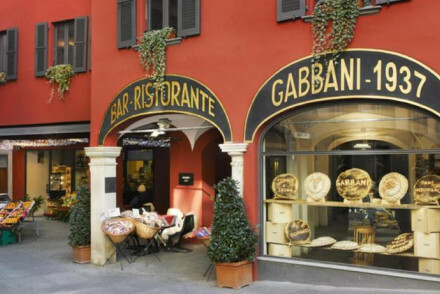 If you're looking for a central location with easy access to the surrounding countryside, Hotel Gabbani is a chic hotel, well placed in the centre of the city. The historic facade hides a strikingly modern interior. Smart rooms with white washed walls, crisp white linen, contemporary furniture and luxury bathrooms. A fine-dining restaurant serves exemplary regional cuisine. 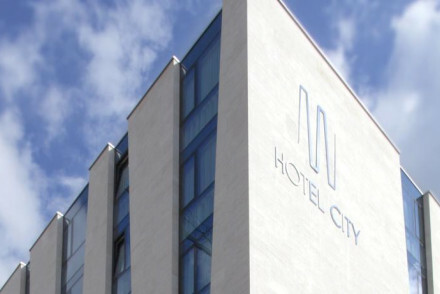 For a contemporary hotel in the historic city of Lugano, Hotel City does not fail to impress. Wonderfully contrasting with its placing, revel in the chic white interiors dotted with vibrant colours. Unwind in the uber slick bar and return to stylish rooms bedecked with modern art. Within walking distance of many attractions. 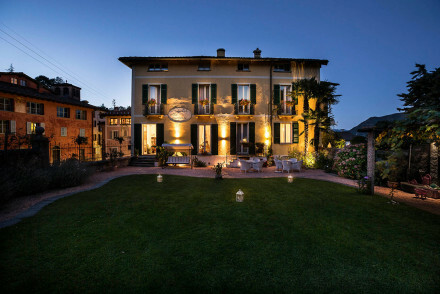 The Hotel Villa Carona is an historic, family-friendly villa in the artist village of Ticino. The 200-year old building has original architectural features, from the vaulted ceiling in the dining room to the exposed beams in the bedrooms. Plush Persian rugs and dark wood furnishings complete this intimate countryside oasis. 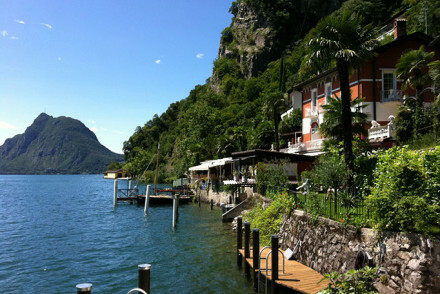 For a hotel that can only be reached by boat, Elvezia al Lago is a traditional lakeside hotel with spectacular views. The cosy rooms boast antique artwork, floral motifs and little balconies. Evenings spent over candlelit dinners and days roaming around picturesque countryside. Total relaxation in charming accommodation. If you'd prefer your own space, don't hesitate to visit our online partner Booking.com for a variety of properties along the shores of the lakes. Best time to visit - March to October is the preferred time to visit Lugano although the summer months of May to September can produce high levels of rainfall. A traditional lakeside hotel with spectacular views. The cosy rooms boast antique artwork, floral motifs and little balconies. Evenings spent over candlelit dinners and days roaming around picturesque countryside. Total relaxation in charming accommodation. Total relaxation - Right on the banks of Lake Lugano, and only accessible by boat, this is the perfect spot to unwind and soak up some views. Great walks - Take a stroll along the lakeside promenade, the perfect way to start your day. Local markets - Stroll down to the nearby village Gandria for some fresh fish. A very contemporary hotel in the historic city of Lugano. Wonderfully contrasting with its placing, revel in the chic white interiors dotted with vibrant colours. Unwind in the uber slick bar and return to stylish rooms bedecked with modern art. Within walking distance of many attractions. Fabulous. Local exploring - Well located within walking distance of the lake and exhibition centre making this an ideal base for exploring the city. Great walks - Take a picturesque stroll along the lakeshore or stretch yourself with Lugano's easy access to challenging alpine hiking trails. A fabulous five-star hotel with a view fit for its emphatic title. The minimalist suites are sleek and cool with sharp contemporary design features and staggering vistas over the lake. Explore the shores of the lake by bicycle or complimentary e-cars. A tranquil oasis. Total relaxation - Soak up the serene atmosphere from the extensive spa treatments, to the excellent restaurant and spectacular service. Romantic Break - The plush suites with deep soaking tubs and private balconies, are perfect for a romantic break by the lake. Sights nearby - Anyone with an interest in plantlife should not miss the botanical gardens on the Brissago Islands on Lake Maggiore. A chic hotel, well placed, in the centre of the city. The historic facade unfurls a strikingly modern interior. Smart rooms with white washed walls, crisp white linen, contemporary furniture and luxury bathrooms. A fine-dining restaurant serves exemplary regional cuisine. Fabulous. Local exploring - Centrally located yet with easy access to the surrounding countryside. The best of both worlds. Great walks - Take a stroll along the picturesque shores of Lake Lugano. Sights nearby - View the stunning 15th century San Lorenzo Cathedral. Sailing - Take a romantic boat ride across the lake. A historic, family-friendly villa in the artist village of Ticino. The 200-year old building has original architectural features, from the vaulted ceiling in the dining room to the exposed beams in the bedrooms. Plush Persian rugs and dark wood furnishings complete this intimate countryside oasis. 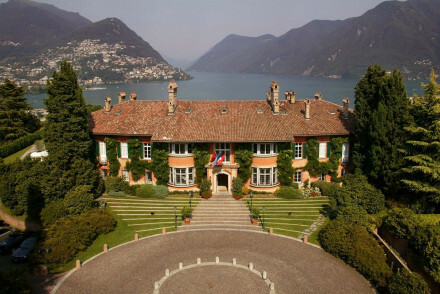 Set in the former palace of a prince, Villa Principe Leopoldo certainly retains its regal grandeur. With opulent rooms, a fantastic restaurant and a charming piano bar, it's a lavish affair. Luxuriate in the Kiso Spa and in the summer recline by the divine pool. An encapsulation of serenity. Foodies - Restaurant Principe Leopoldo is considered one of the finest in the area, offering authentic and resposibly sourced cuisine. Honeymoons - This lavish property, perched high over the lake offers a pampering spa, elegant suites and private Jacuzzis! Sights nearby - Visit the nearby historic Cathedral of San Lorenzo, dating back to the 9th century. Five star luxury in the most breathtaking of surroundings. All the traditional and luxurious rooms have their own unique character, and views of the serene landscape. Feast on Michelin starred cuisine at the on site restaurant. Come here for serious lakeside pampering. Romantic Break - A super chic hotel with luxurious rooms surrounded by beautiful sub tropical gardens- ideal for couples. Local exploring - In a good location, easy to explore Lugano and its museums, mountains, the lake, festivals and gardens. 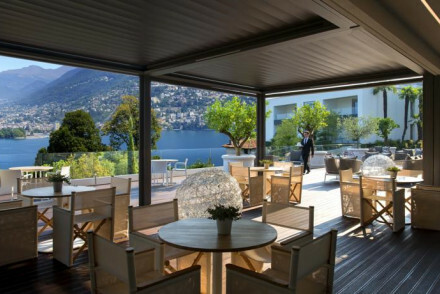 Foodies - The Arte Al Lago is a Michelin star restaurant serving gourmet cuisine in a relaxed setting. Great walks - Wonderful walking, with spectacular Alpine views through the mountains and all along the lake.